Chelsea manager Maurizio Sarri’s personal intervention was reportedly key to the club clinching the transfer of Gonzalo Higuain on loan. As noted by the reliable Italian reporter Fabrizio Romano in the tweet below, the Blues look set to finalise the loan signing of the Argentina international imminently. However, this was not all plain sailing for Chelsea, with key figures at the club seemingly not that keen on going all in for Higuain, with Sarri himself having to make it clear he was ‘adamant’ he was the player he wanted. 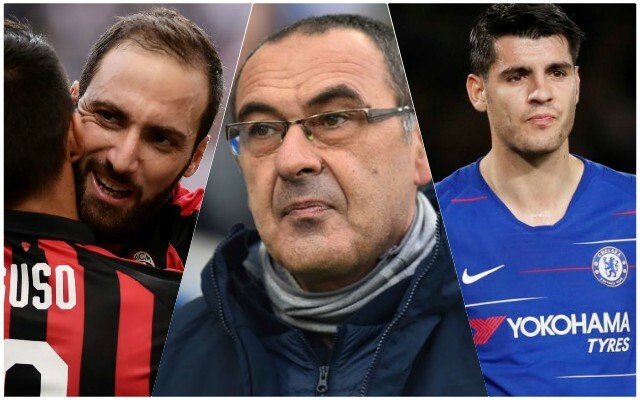 Chelsea have backed Sarri on this – Higuain, aged 31, on loan would not have been the club's choice but the head coach was adamant he wanted him. Morata will now leave, either on loan or permanently. As noted by Romano, the initial Higuain deal is only on loan, and while this can be made permanent, it can also be extended by a year. This seems a relatively low-risk move for Chelsea, who will perhaps have been concerned about sanctioning a permanent deal for the 31-year-old due to his age. Still, Sarri worked with Higuain at Napoli and fans will be happy to see them reunited at Stamford Bridge, where there has been a notable lack of a world class centre-forward since Diego Costa left last season. As noted by Law, Spanish flop Alvaro Morata should now leave to make way for Higuain, in what has to go down as a big, big upgrade for CFC.